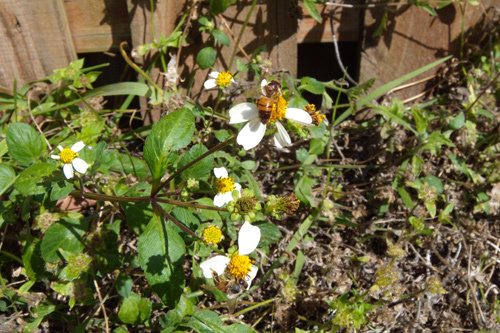 Spanish Needle (Bidens alba) is a wildflower that blooms year round in South Florida. 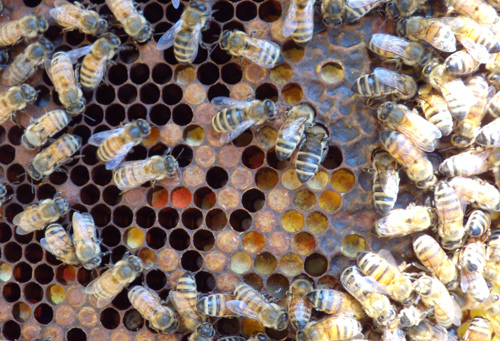 It is a source of both pollen and nectar for bees. Many people consider it a weed because it can spread very quickly and has seeds that are hard to remove from clothing and pet’s fur. 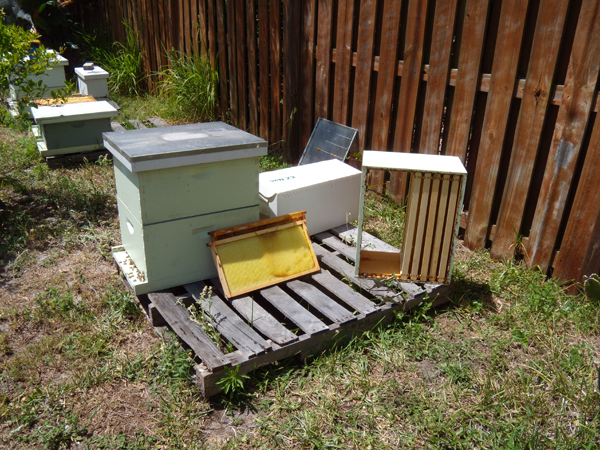 I used to consider it a weed too until I started beekeeping and realized it is a great wildflower for them. There is an area in my backyard full of it, but I resist cutting it because I see my bees and many other native foragers enjoying the pollen and nectar this plant provides. 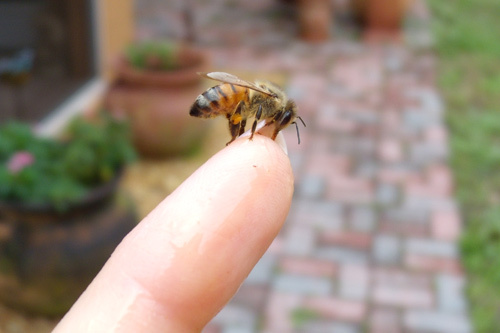 While outside preparing some honey to feed to one of our hives that had low stores, this girl landed on my sticky finger for a drink of honey. 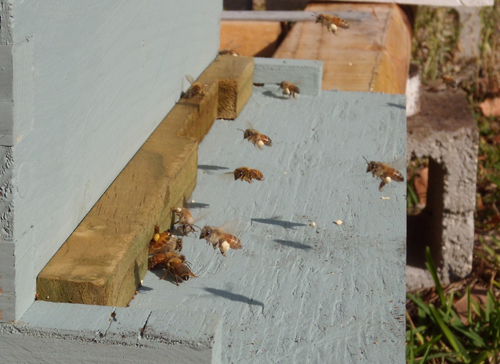 You can even see she had been out collecting pollen as she had some yellow pollen in her pollen basket. 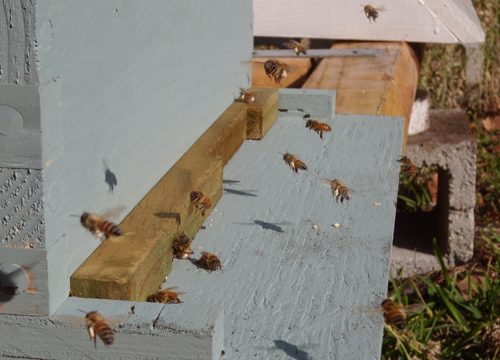 When she was done I watched as she flew right back to her hive. It has been a mild December for us here is South Florida. 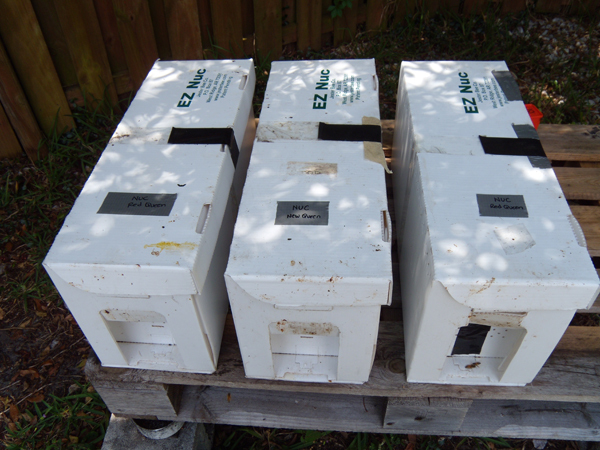 Our hives have been reduced down to one brood chamber, but the bees are active and foraging. So far our average day time temperatures have been 77-80° F (25-27° C). With our temperate climate there is always some type of flower in bloom year round. Right now Florida Pusley (Richardia scabra), also commonly called Mexican Clover, is blooming everywhere. 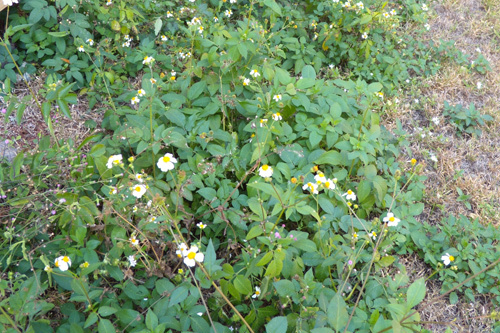 Many people consider it a weed, but its small white-purplish flowers are a good source of pollen and nectar for bees. 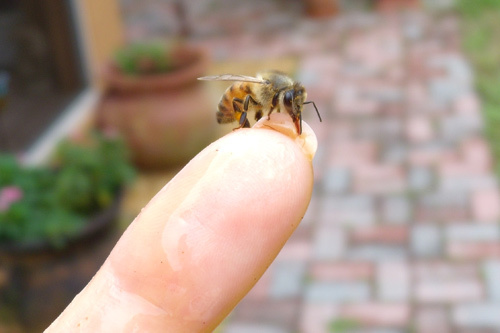 This worker bee was foraging in my backyard. 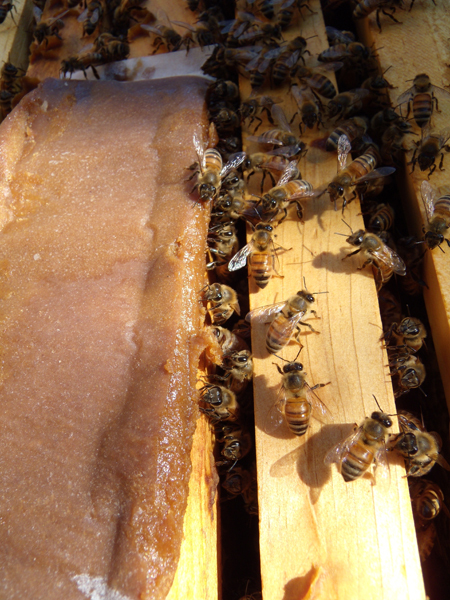 You can see the white fuzzy pollen all over her head and she already has some yellow pollen in her pollen basket. Here you can actually see that her wings are damaged, but she had no problem flying from flower to flower. Off she goes again! 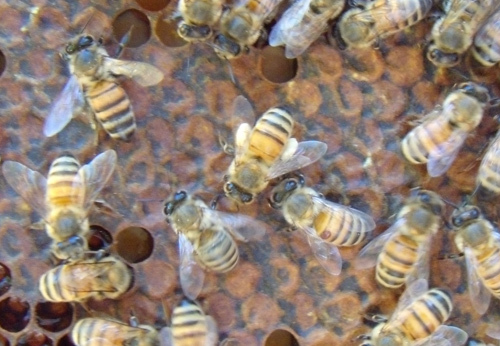 Loaded with pollen. 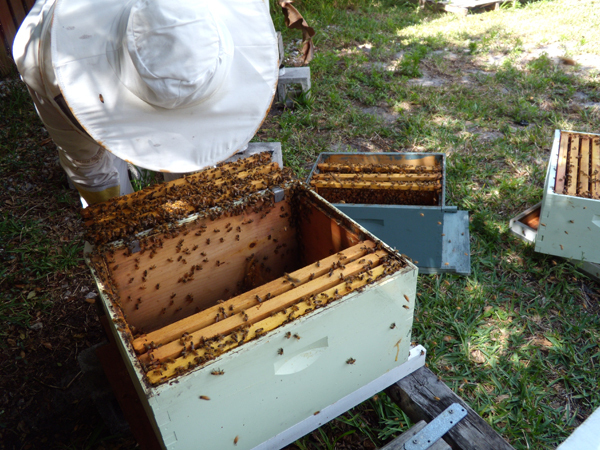 It has been a very warm and wet winter so far for us here in South Florida. It is already Dec 20th and we are still in the upper 70’s – 80 F (upper 20’s C). With all the warmer temperatures and rain we have been getting, there are plenty of flowering plants and grasses all around. 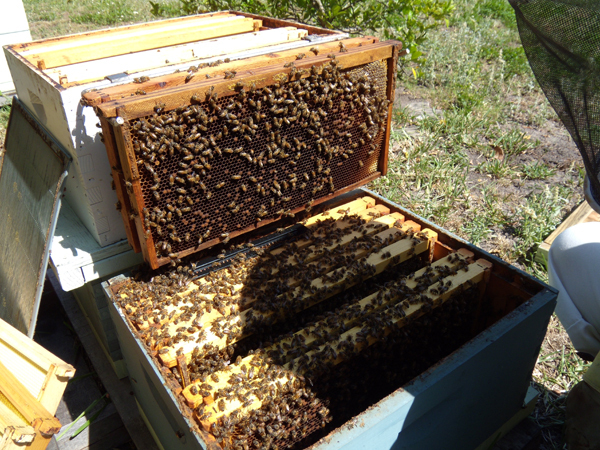 Our bees have a good supply of pollen and honey stored up. 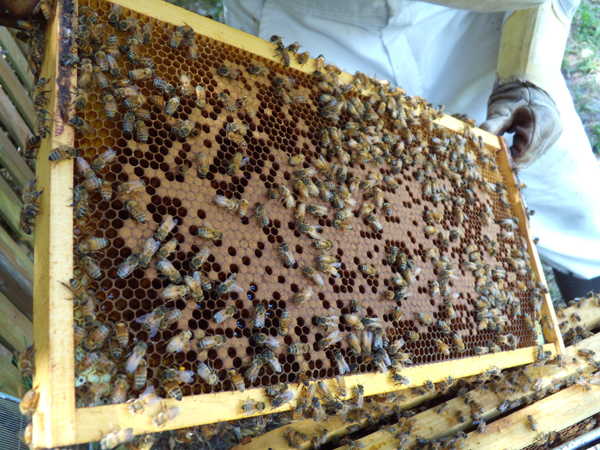 We noticed a variety of pollen colors and it looks so pretty in the comb – vibrant oranges, yellows and white. 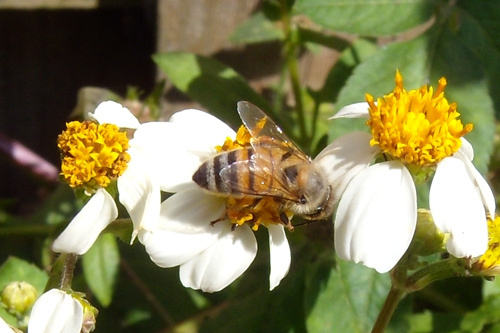 Then we saw this little bee full of pollen on her legs – she was certainly busy collecting. See the white puffs. 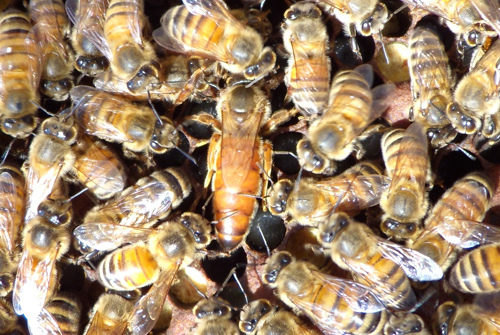 And then we were graced with seeing our wonderful queen from this hive. Next week we will be visitng our family in Greece. 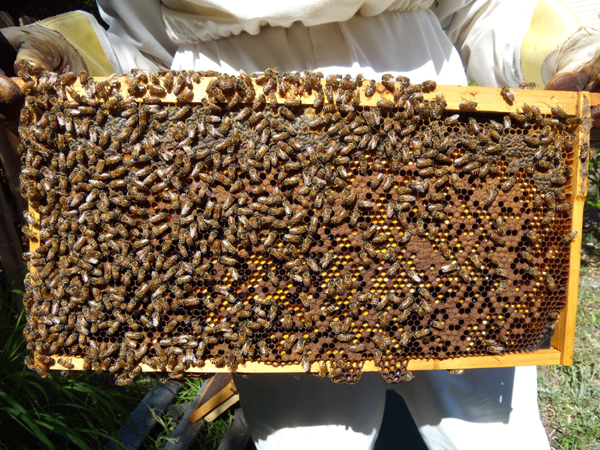 I am hoping I will be able to post some pictures of Greek bees and beekeeping practices there.